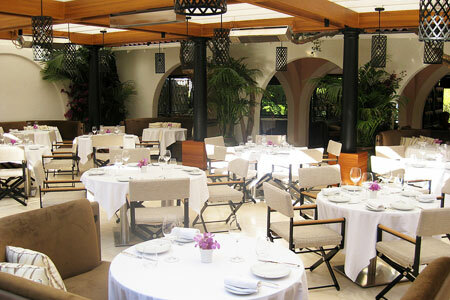 Simple yet elegant California cuisine by über-chef Wolfgang Puck at the iconic Hotel Bel-Air. 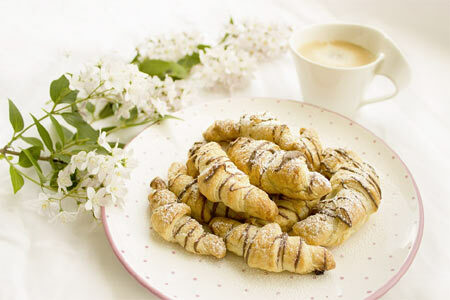 Breakfast & Dinner daily, Lunch Mon.-Sat., Brunch Sun., Afternoon Tea Fri.-Sat. : With this eponymous establishment at Hotel Bel-Air, über-chef Wolfgang Puck had the challenge of not only living up to his own reputation, but also to that of the iconic hotel. We can report that the mission has been accomplished. Inside the restaurant, glass wine cellars and a fireplace separate one of the private rooms from the rest of the dining area. The most desirable tables are the semi-private booths tucked away in alcoves on the heated patio. Meanwhile, the bar also boasts al fresco and indoor seating. Puck has composed an elegant and true California-cuisine menu made with fresh produce from local farmers markets, all-natural poultry and sustainable seafood. In addition to the à la carte offerings, there's "A Taste of the Market" menu and "Chef's Tasting Menu." Starters might include a kale salad or tuna tartare with Japanese cucumber, avocado, chili aïoli and young shiso blossoms. Also worth considering is the tagliatelle with truffles (when in season). Main dishes might range from rack of lamb to snapper in green curry to Cantonese roasted duck, though keep in mind that Puck’s signature wiener schnitzel is available upon request. Rotating daily specials feature homey dishes like fried chicken with buttermilk biscuits and gravy. Cheese comes in a selection of six artisanal varieties, set on a marble slab with wildflower honeycomb and quince paste. Desserts might include a chocolate hazelnut crunch bar. The wine list is quite impressive, and service is dedicated and attentive.